After receiving his M.D. degree at Michigan State University in 1991, Dr. Tay completed his first-year residency in Internal Medicine at Naval Hospital, Oakland, California. As a Health Profession Scholarship Program participant, Dr. Tay spent time with the U.S. Navy Submarine Fleet as an Undersea and Diving Medical Officer, before entering and completing his residency in Radiation Oncology at the Saint Mary’s and Integrated Hospitals Program in San Francisco, from 1995-1998. Soon thereafter, he became Board Certified by the American Board of Radiology in Radiation Oncology. During his training and early years of practice, he developed special interests in brachytherapy and stereotactic radiosurgery. 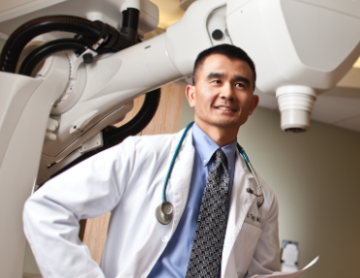 Since 1998, Dr. Tay has been in private practice with Radiation Oncology Associates in Reno, Nevada. Dr. Tay implemented a low-dose-rate brachytherapy program at Saint Mary’s in 1998, and he became Chair of the Cancer Committee at Saint Mary’s Regional Medical Center in Reno, Nevada, in 2004. When the Radiation Oncology Department at Saint Mary’s opened in 2005, he took on the role of Medical Director. Among his accomplishments as Medical Director are the establishment of cancer clinical trials, implementation of intensity modulated radiation therapy, high dose rate brachytherapy, and now stereotactic cranial and body radiosurgery with the Cyberknife technology. Dr. Tay has also been active as a consultant for a brachytherapy technology company, as well as a consultant for the Northern Nevada Hyperbaric Center. His memberships include the Washoe County Medical Society, Nevada Oncology Society, Wilderness Medical Society, American Brachytherapy Society, American College of Radiation Oncology, American Society for Therapeutic Radiology and Oncology, and Cyberknife Society.